…Or maybe “IS Leaders Fear Islamophobia will Rise Following Planned 2016 Bombing.” I paraphrase a satirical headline from the mind of Mark Steyn. But satire is hardly satire anymore, with less and less daylight to be found between dystopian black comedy and the stone-faced social commentary of elites. 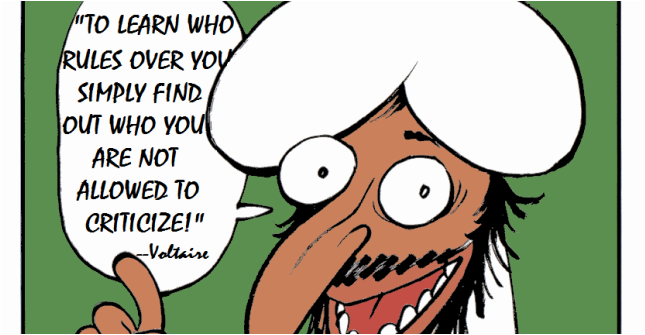 After a Jihadist attack on the staff of satirical magazine Charlie Hebdo left 17 dead in Paris, responses were mixed. Too mixed. One would think all civilized people could shun any reactions other than mourning for the victims or a sense of grievance against the perpetrators. At least during the first few weeks following the atrocity. I’m reminded of an aristocratic Northeastern girl I once knew—the daughter of a long line of well-heeled, genteel progressives—who responded to the 2009 mass murder at Fort Hood with a mournful pout. “Nooo…” she canted. “I just know people will use this to make the Muslim community look bad.” I stared at her in disbelief. “What!” she asked. I reminded her of the 13 dead and over 30 injured. “Oh,” she said with a start. “Yes, that is too bad.” In fact, she makes the Muslim community look bad. With friends like her, who needs conservatives? Outside the small circles close enough to the opinion makers to feel personally invested, few of us can stomach their ham-fisted rebukes against common humanity. Of course Europeans and Americans are enraged by the recent attack on free society. Of course there has been a rise in Western pride in defiance to the monstrous movement that shows no regard for innocent human life. Of course we are disgusted with the perverse religiosity of the gunman who coolly told a pretty Frenchwoman to “cover [herself],” as he forced her to unlock the door on his way into the Hebdo offices, adding insult to hellish injury. But we’re used to misguided compassion among the soft elites. As an American Christian, here’s what kicks me in the teeth: Before we could recover from the shock of the attack, Bill Donahue of the Catholic League screamed that “MUSLIMS ARE RIGHT TO BE ANGRY” at Charlie Hebdo, and that if the publisher of the “disgusting” magazine hadn’t been so “narcissistic,” he would never have been killed. As if the content of the Charlie Hebdo magazine were even the topic on our minds, and not—as in Donahue’s case—merely a prop for unfeeling cowards to showcase their phony moral gallantry and intellectual sophistication. This isn’t about proving that we’re more refined than the brilliant rogues at Charlie Hebdo. It’s about respecting the dignity and rights of human beings whether we particularly like them or not—a minimum condition of civilized society which barbarian Islamists—and apparently some Catholics—are unable or unwilling to meet. While Islamists threaten to tear the world up by its roots, Donahue’s outburst was only another voice in a chorus of Western warnings to the West. When faced with hordes of enemies hard upon them on the one side, and a crude but kindly civilization of friends on the other, the Donahues of the world will always discover a newfound eagerness to turn the other cheek.